I wrote Part I of this series four months ago; OK I'm going to try to keep up and not give longer pauses to this series (Life: busy). Park of the 2018 Northern Border Collection Rare releases, the label here says this is blended with whiskies from eleven casks. Really? That's it? How big are those casks, anyway? I find this extremely hard to believe. Apparently it gets its name from the eleven children that William Gooderham adopted when all of their parents died during their migration to Toronto. This is a freshly opened bottle. The colour is a medium caramel. Sweet and sharp on the nose, with butterscotch and vanilla pudding predominant. Cinnamon, cloves, nutmeg - nice rich spices. Hint of ginger. Dark honey. Fruity with baked apples, poached pear and golden raisin. Hay. Bit of eucalyptus. Maltier (and with more caramel) when you add a drop of water. Rich and grainy (in a really good way), if a touch sweet. But here that's OK as it's nicely balanced by the grainy grassy notes. On the palate we have more spices than we get on the nose, with some chill and black pepper. Darker caramel, softer vanilla and rum-raisin. Rye and crisp malt seem to be a bit more predominant. Charred oak. Ginger again. Creamy mouthfeel, which becomes almost syrupy with a drop of water (and spicier). 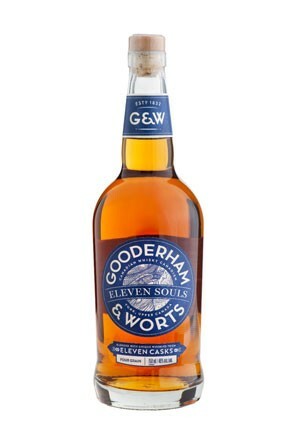 Fantastic stuff - a Canadian whisky dialled up a few notches. The long finish develops from oak and caramel into baking spices and peppery arugula. This is a much richer variant on the standard G&W, with a huge mouth-filling melange of grain, oak, spice and dark dried fruit. I still have a bit of the previous year's Little Trinity release; side-by-side, the Eleven Souls is richer where the Little Trinity is a bit more biscuity. Side-by-side-by-side with the standard G&W Four Grain, it's also much richer; in fact, the Four Grain and the Little Trinity are much more in the same wheelhouse. In any case, the Eleven Souls is a rich, spicy, complex fella. Like he does with the other two, Jim Murray scores this one a 94. From the Master class last year, at SOT, Dr. L mentioned there were 11 different types of grain used, and different casks, but I don't remember him being more specific about the casks. Apparently, well, according to the doc, it was bottled at 40% because the original distillery was at 49 Wellington Street. I liked the nose, but the palate didn't excite me, so I passed on buying a bottle. I would gladly re-taste, but I don't think it will be in my cabinet. Which, given the rate at which my cabinet is accessed, is probably for the best. 18 days ago 2Who liked this? Happened to be downtown Toronto last week and remembered a post on another forum regarding several heavily discounted Whiskies at Queen and Coxwell. Was able to get a lonely looking 11 Souls for $70. Made my day. 12 days ago 1Who liked this? @Astroke, nice find! I don't yet have Eleven Souls in my cabinet, no sense of urgency. I suppose a discounted price would make it the right time to pull the trigger...before they all disappear. @Nozinan Yes, I have never come across one of these 30% discounts at any LCBO. I have gone through close to 1/2 a bottle, probably would not have replaced it until seeing at that price. Very good (Textbook) Canadian Whisky though IMO.